A Sashimi X-Wing is a Finned X-Wing that does not have a candidate for the constituent X-Wing in the box that contains the fin. 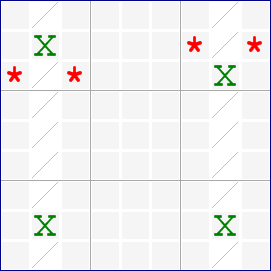 With an extra candidate in r2c8, this would be a Finned X-Wing in columns 2 and 8, rows 2 and 8, with the fin in box 3. 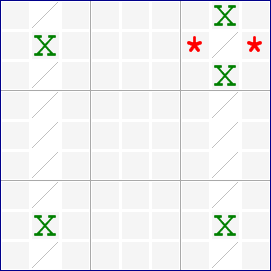 With an extra candidate in r3c2, this would be a Finned X-Wing in columns 2 and 8, rows 3 and 8, with the fin in box 1. The same pattern can also be interpreted as a Skyscraper. This pattern can only be interpreted as a Sashimi X-Wing with the 2-candidate fin in box 3. This page was last modified 12:33, 25 November 2006.